Our donors have chosen to invest in the health and safety of those living in our communities. Their gifts allow us to expand critical services, offer new programs and support the needs of patients and families aging or recovering at home. In a new series, we’re excited to introduce you to a few of these very generous and selfless donors. 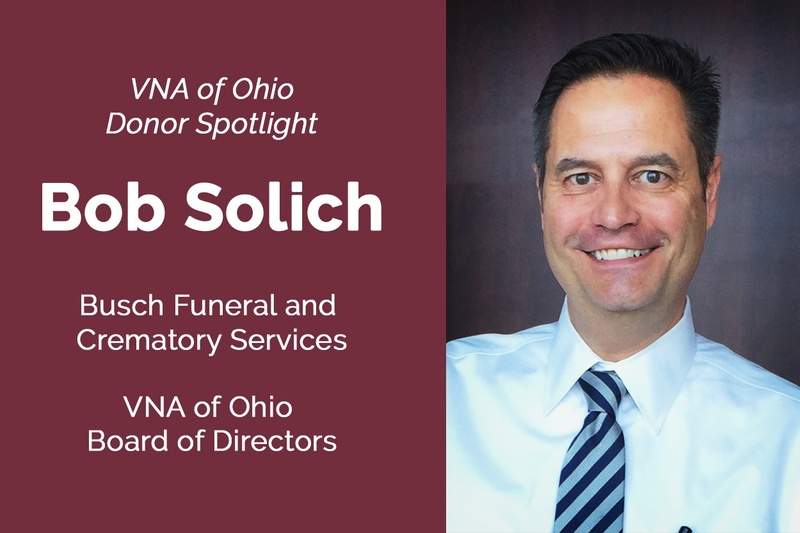 As a VNA of Ohio supporter for 10 years, Bob Solich has served on VNA of Ohio’s Board of Directors for five years. He is the Funeral Director and Location Manager at Busch Funeral and Crematory Services and currently oversees their locations in Parma, North Royalton and Fairview Park. He has worked for Busch for 34 years caring for families in need. How do you make your decisions on which organizations to give to? When I think about making donations to any organization I prefer to know that the donation has an impact. I really like to consider local non-profits first. I also think it is great when my donation is targeted to actual need in the organization. For instance we have a Patient Emergency Fund and an Employee Emergency Fund which help the VNA assist people with real problems they may be facing in their lives. I also appreciate that the VNA does more for mental health care than any other organization in our area. What advice do you have for others who are trying to decide on which organizations to give to? I think everyone should be careful and passionate about what organization they choose to support. The best way to know for sure that your generosity is appreciated is to get involved. Any non-profit should be very willing to be open with a potential donor about how they are going to use their donation. Why do you give to VNA of Ohio? I give to the VNA because I appreciate the long history of caring for Cleveland that only VNA can claim. The company I work for has been around since 1905 and just like us, the VNA has to have earned their longevity. Companies and agencies do not survive for over a century offering inferior care. Tell us about a particular accomplishment or highlight that you’re proud of. Being chair of the Development Committee for the VNA has allowed me to take pride in achieving fundraising goals and connecting with our community and generous donors at multiple benefits. I am always surprised by the willingness of Cleveland to give to causes that enrich people’s lives and I feel that is what we are doing every day at the VNA. Call us today at 1-877-698-6264 to learn more about philanthropy or how to get involved.